Is there a better alternative to Smiley's Challenge? Is Smiley's Challenge really the best app in Arcade category? Will Smiley's Challenge work good on macOS 10.13.4? Smiley's Challenge is a fun game for elementary aged students which also requires a bit of thought and planning. Can you find Smiley before the Badees get you? 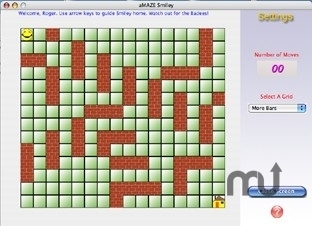 Can you click quickly enough to capture Smiley or lead him to home through a brick wall maze? This program includes three games: Find Smiley, Capture Smiley, and aMAZE Smiley. The program is entertaining with colorful graphics and sounds. Smiley's Challenge is offered free of charge for its use. Smiley's Challenge needs a review. Be the first to review this app and get the discussion started! Smiley's Challenge needs a rating. Be the first to rate this app and get the discussion started!